When you are doing your art as a way to make a living, production work is a necessary task. Early on, everything I made was one of a kind. But at some point you reach a level of sales where that is just not possible anymore. For me that was a number of years ago. Simply defined, production work is making multiples of the same thing. Usually the copies are exactly the same, but often I just can not help myself from making at least one change on each item. The advantage of production work is that it is an efficient use of time. 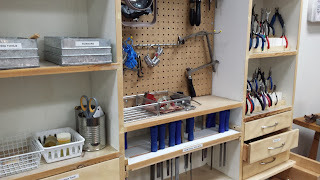 I can lay out components and then create multiples of the same or similar item completing one step on all items at a time. 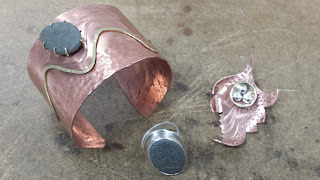 In this example I am making multiple pairs of hammered earrings at once. I gather materials and lay them out. I add beads to copper headpins. In this case I am making slight variations so that each pair is unique. Next I cut and bend the wires on all of the beaded components and layout the wire to create the hand hammered daggers and coil dangles. I hammer all the daggers at once and then create all of the coils. 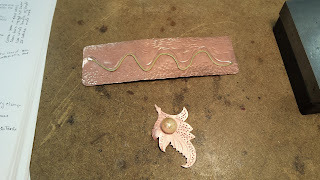 Another efficiency step is that the daggers and coils are usually created from the tops of the headpins I have cut from the beaded components. No waste! When all the components are ready I create the earrings paying attention to the order of the dangles so that each half of a pair is a mirror image of the other. The last step is to prepare the earring cards and hang the earrings on their cards.. I create and print my own cards. I cut them using a paper cutter, punch holes for the ear wires and fold them. Again, this is a type of production work. Each card is priced and a description of the materials used is added. The finished earrings are counted and added to inventory and then set near my light box for photography. Production work is good for popular items and for items that are similar in design. But do not fear, every piece I make is still given thought and care in its creation. Another post in my series about the business side of an art business. Many assume when an artist is not doing shows they must have plenty of free time. If you are doing your art as a way to make a living then that is not the case. For me January is all about numbers! My first task in January is to bring all of my bookkeeping up to date for the previous year and make blank ones for the new year. There are many methods you can use to keep track of things. 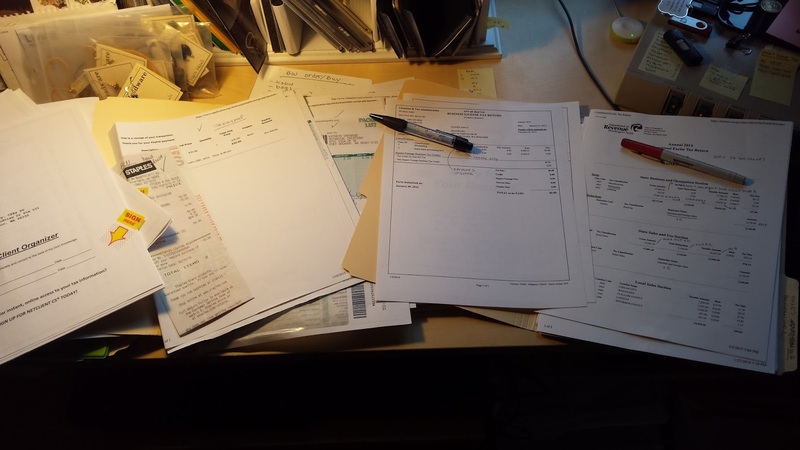 There are off the shelf accounting programs like Quickbooks and Quicken, and programs specifically designed to track an artists inventory. 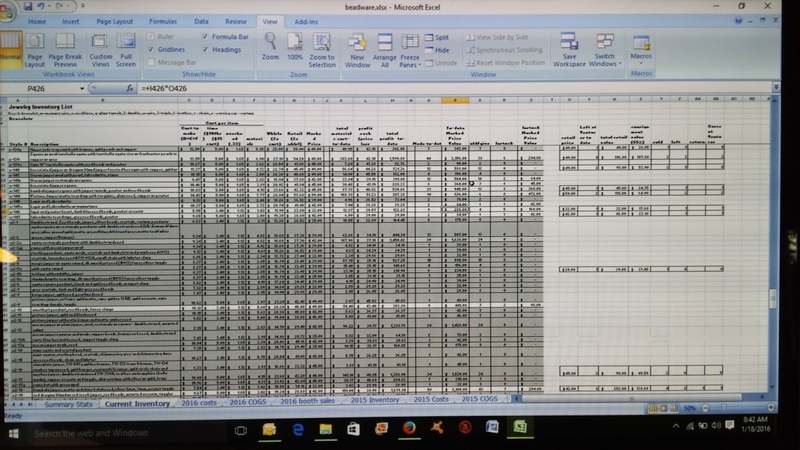 When I started my business in 2001 I set up a series of worksheets in Excel and I have continued to expand on these over the years. My accountant says they are fine and no reason to change. Summary - Tracks income by type (instate, outstate, wholesale, consignment, shipping & handling), income and taxes by location (each city in WA has a different tax rate/code), overall monthly income/expenses and profit/loss. COGS - cost of good sold per month. Uses materials costs and number of each item sold. Booth Sales - Tracks each show I do with what sold, # days, # hours, # sales and expenses. These numbers are used to calculate sales/items/$/cost/profit per hour. I use these figures to rank the shows I do and drop out the bottom ones each year. 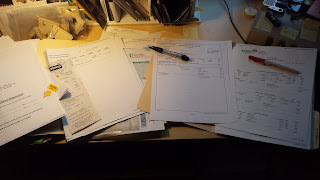 I collect all my data (go through credit card statements, checkbook registers, receipt files, etc) and populate any data that is missing. I should note here that during the year every Monday is book keeping day. That way this is not such a horrendous task. 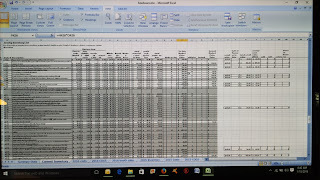 I also check the formulas in the worksheets. My next task is inventory. I count all the items made. I am usually pretty close to what was recorded in my spreadsheet. Earrings are the place I can be off a few. Now I am ready to do local, state and federal taxes. Yippy skippy! In January I also inventory my display items, make list of things to clean, repair or touch up (stands, tent frame and walls, tables, shelves, table cloths, shutters, banners). And I take stock of supplies I need to reorder (bags, tissue paper, tape, ink, biz cards). I also make a list of items to make and the things I will need to make them. Whew, tired yet? The month is not over. I also need to plan my shows for the year and get show applications out. 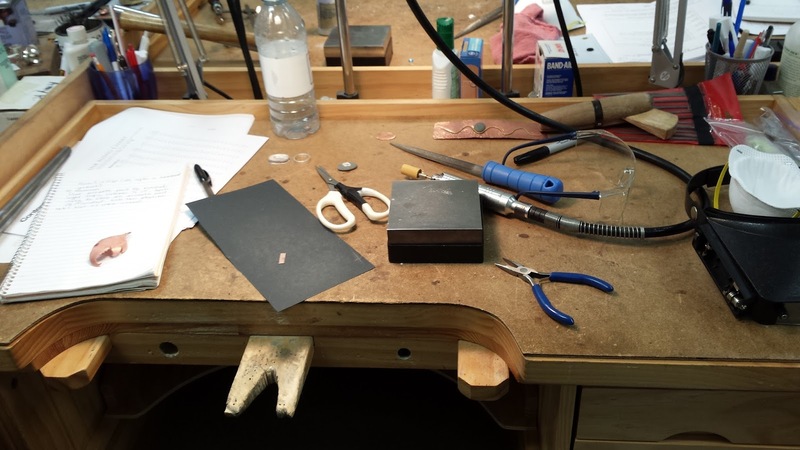 I need to keep up with my business Facebook page, newsletter and blog, learn new skills and start making things. Being self employed is hard work. but I love it!!! Thanks to all my customers, friends and supporters who have made this dream a reality. This morning I had an excellent question in my inbox from Rachel asking about cooper ear wires and metal sensitivity. I have tried to pick through the wide variety of information on the internet to come up with the information below. Ultimately there are no definitive answers as your sensitivity can depend on so many factors including your age (hormones), the weather (hot? ), and how the item was made. As with many things, there are exceptions to every rule!! *Nickel is the big culprit in metal allergies. Avoid it. It’s the most common metal allergy, and occurs in approximately 10% of the population. Base metal, iron, goldplated, gold & surgical steel contain nickel. * Surgical steel which is touted for those with allergies can occasionally contain trace amounts of nickle. *Aluminum is good for most people, but not often used. *Copper is a pure metal — it does not contain any other metals. Is is fairly inert and allergies to it are rare, but there are folks who react to it. If you are able to wear sterling silver, it is likely you will be fine with copper. Will copper turn your skin green? It is possible if you wear it very long term. But to wear a pair of earrings for a day? No. Fun fact: Copper is antimicrobial & 100% recyclable. * Brass is an alloy of copper & zinc. It is good for most people, but there are folks who react to it. * In Gold-filled (GF) jewelry the gold is permanently bonded to the base metal. It has an approximately 50-100x thicker coating of gold than gold-plated jewelry, so it can be worn longer. Gold-fill pieces do contain trace amounts of nickel, and may need to be avoided for those with extreme sensitivity. 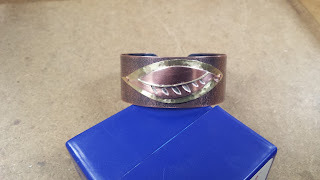 * Silver or gold plated are made of a base metal (usually copper, but sometimes iron, nickel or zinc), which then undergoes a process called “electroplating” to coat the surface of the metal with a thin plating of metal (either sterling silver or 14kt gold). 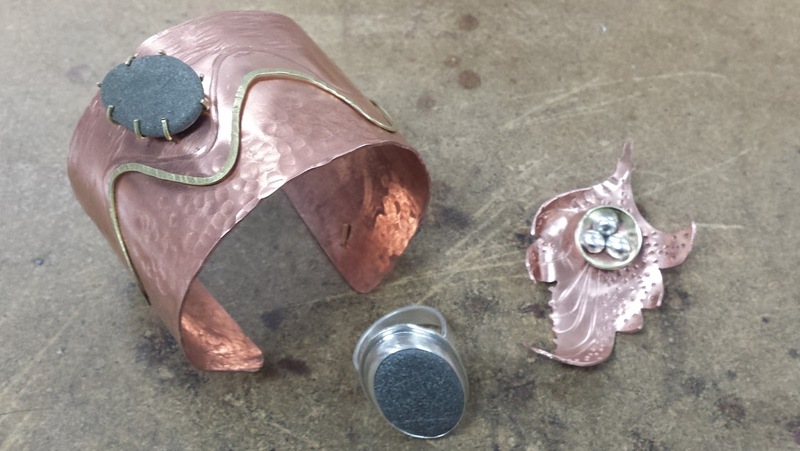 Jewelry finished in this way is generally not ideal for long-term wear, as the plating can wear off over time. For those with metal sensitivities, this means that once the plating begins to wear, the underlying metal will be exposed and can cause irritation. *Fine (995) silver is good for most people, but there are folks who react to it. * Sterling silver is 92.5% silver and 7.5% copper. It can have a trace amount of nickle. It is good for most people. Sterling silver can leave black marks on your skin due to a reaction with the copper content & the tarnishing of the jewelry. To avoid this, remove jewelry when showering and dry completely before wearing. * Avoid wearing the offending metals for extended periods of time. * Do not get jewelry wet: Moisture trapped between the metal and your skin can increase your chances of sensitivity. *Avoid base metals when you’re perspiring: nickel breaks down quickly in the presence of sweat (salt), and can cause your skin to flare up — this is why many people find metal allergies “worsen” in the summer months. As we age our reactions to metals change (thank you hormones!) If you have a pair you love and you start reacting to them, an occasional coat of clear nail polish on the earwire should help. 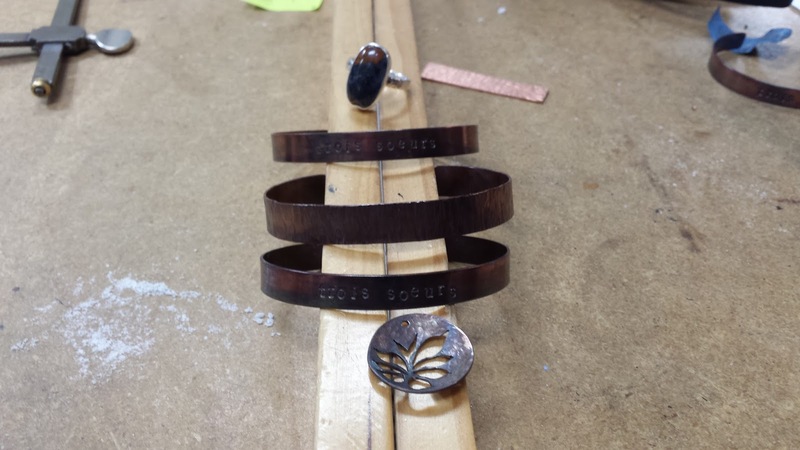 **Information for this article was collected from various sources including Rena Klingenberg's Jewelry Making Journal and The Art of Brilliance Found Jewelry. Besides being a month for inventory and bookkeeping, January has become a month for learning. 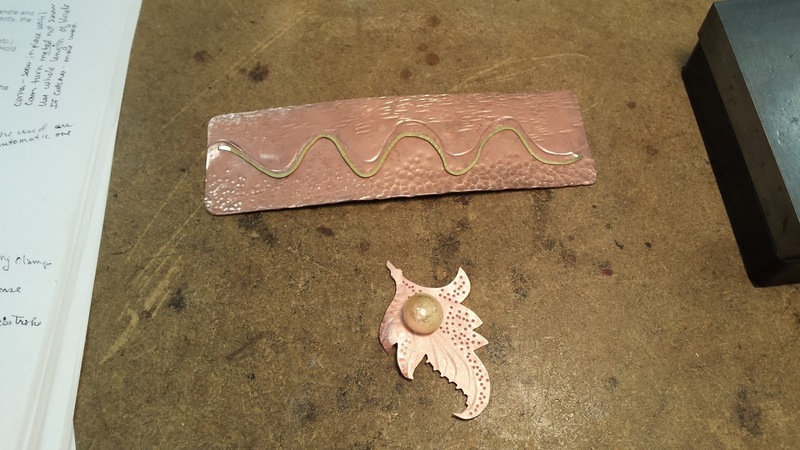 I kicked off the new year with a intensive metalsmithing weekend at Tacoma Metal Arts Center in Tacoma. Three full days of sawing, filing, stamping, hammering, texturing, bezel setting stones, making rings, chain fabrication and lots of soldering. What fun! I hope to have time in the next several months to create some new designs incorporating what I learned. Amy Reeves, the owner and our instructor is a tool junkie and we had quite the array of hand and power tools to experiment on. 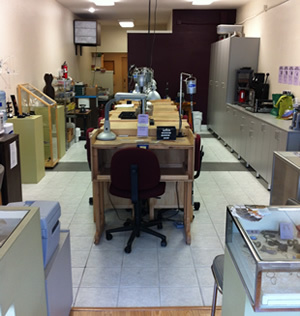 The Center is a cozy spot, well laid out with separate stations for each type of work. 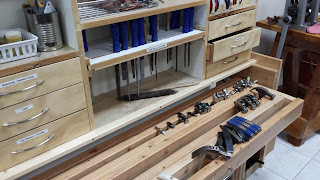 Day one had us sawing and filing. The class was small so there was plenty of individual instruction. I was not too bad at this. Slow and steady, a gentle grip and patience were key. I selected a leaf pattern and got down to business. I was so focused I did not take too many pictures of the work in process. 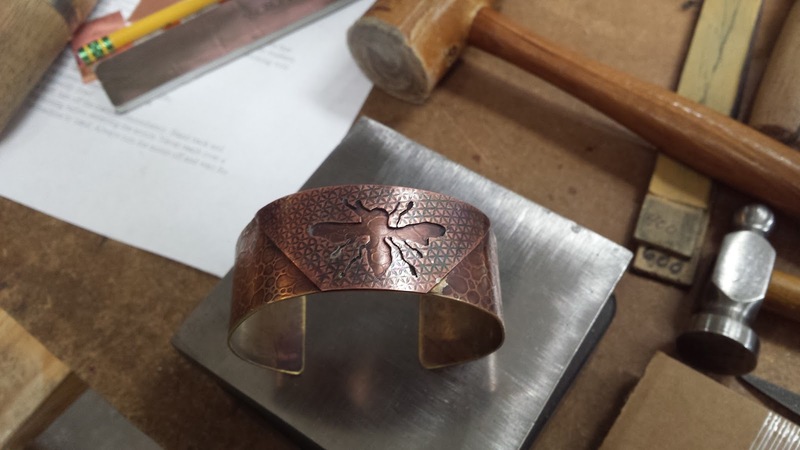 I also began a cuff bracelet that went through many changes as the weekend wore on. My goals were to try and incorporate as many techniques as possible, rather than work on a specific design or outcome. Below is what I had at the end of day 1. 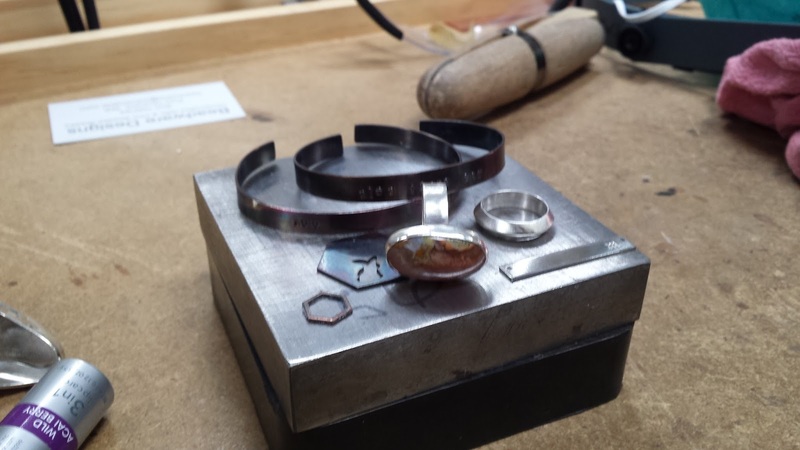 Day two was focused on rings and bezel setting a stone, new techniques to me. I had no idea how much work goes into such a ring! For fun I chose to work with a small beach stone I had brought along. We each had our own jewelers bench to work on. I just may have to get me one of these. I was also lucky that many of the tools I needed were stored just behind me within easy reach. Love the pull out for hammers! 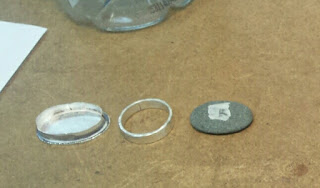 At the end of day two I had a ring, bezel and my stone. Because my stone was not symmetrical I marked it with a piece of tape so I knew the top and which direction it went into the bezel. Day three we needed to finish up all of our projects. First up was finishing the ring and setting the stone. My word that took a lot of polishing! So many little wheels and compounds. Here are my finished projects. 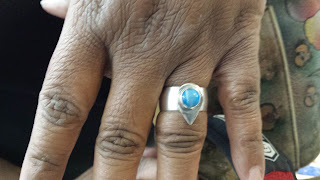 I do not usually wear rings so I was surprised how comfortable it is. The copper leaf pendant has a small brass nest filled with 3 sterling eggs. 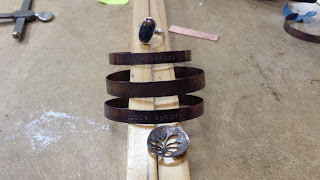 I may add some patina to the leaf. The bracelet has a story. The lower portion represents the edge of the ocean, the brass wire is the edge of the water. The indented wave is the mark left on the sand by water as the tide goes out. The texture on the top is the beach and then I added a beach pebble. The setting for the pebble needs to be redone as I have an idea for a better way to do it so the prongs are even. And the I need to soften the edges as they are a bit sharp. Check out the TMAC website for a list of their classes. There are classes for all skill levels, one day, multi-day. I will definitely be taking more. They also sell a variety of tools and supplies. You can see examples of the work of other students on their Facebook page. Below are some pictures of the other students work from my class.